On National Pancake Day, Febrary 27th, IHOP had its first ever Kid Culinary Team participate in a pancake contest. During this inaugural year a Plano native and former patient of Children’s Health, Sim Scott, submitted ‘SIMcakes’. These mouthwatering buttermilk pancakes mixed with milk chocolate and toffee chunks include all kind of delicious toppings such as whipped cream, caramel sauce, and to top it off an additional sprinkle of toffee candy. As a result, Sim Scott was chosen to be one of the top three finalists of the competition. Sim has been a Children’s Miracle Network National Champion since 2012 and his parents are huge advocates for CMN and Children’s Health. 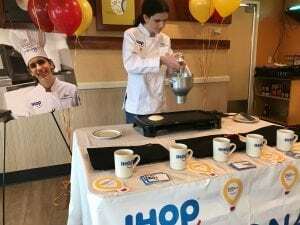 We are very proud to have had Sim represent CMN and Children’s Health as a member of IHOP’s for ever Kid Culinary team.